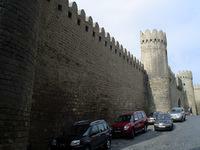 Azerbaijan believes that the keys to solving important for them are the Karabakh issue in Moscow. For this illusion of Azerbaijan will pay a high price. Baku ready for Karabakh "blitzkrieg". Azerbaijan's military budget in 2013 was $ 3.7 billion Baku Moscow intensively supplies of arms and military equipment for several years. Armenia, Azerbaijan prepares a "blitzkrieg", without thinking about what would happen in the event of its failure. The South Caucasus energy corridor can be cut. And it will be beneficial to Russia. The emergence of Azerbaijani gas to Europe, Moscow does not need. Yet she no longer needed there Turkmen gas, which will certainly eventually come after Azerbaijan in case of implementation of the Trans-Caspian gas pipeline. Escalation of tensions and thawing Karabakh hands Baku Moscow hopes to solve just three strategic objectives: do not miss the Azerbaijani gas to Europe, make it impossible to implement the Trans-Caspian project for Turkmen gas and, consequently, to take control of competing flows of resources of both countries and to tie it on yourself . Fiasco Nabucco West will mean for Azerbaijan goodbye to the dream of the return of Nagorno-Karabakh. The EU has no active position in this matter. Ignoring the energy priorities of the EU will not pass unnoticed in Brussels, as well as in a number of EU countries. The countries of the Visegrad Group, Bulgaria, Romania, due to the remoteness of the problem of Azerbaijan will increase prospects for reducing dependence on Russian gas. Therefore, sound is their focus on creating capacity of LNG terminals on the gas project north-south corridor (Poland, Croatia), which should unite them. As well as LNG from the U.S. instead of the problem of Azerbaijani gas. Assessing the economic feasibility of TAP may raise the question of its future profitability for the pool participants. Albania consumes more than 20 million cubic meters of gas per year and has no importance as a promising market for gas for the TAP. In Italy, there is a decrease in consumption of gas, due to the high price of it while maintaining the unstable economic situation in the country. The absence of TAP shareholders of Italian energy company also will promote the expansion of Azerbaijani gas niche in this market. With a relatively small amount of the gas market (less than 4 billion cubic meters per year), Greece also can not become a major consumer of Azerbaijani gas. Entering the market of the Balkan countries through the construction of pipeline laterals is not a serious prospect. Receive up these small markets, and countries are parties to the European Energy Community. Contrary to the reluctance of SOCAR will have to respect the tenets of the European energy legislation. TAP is a project that does not lead to significant benefits for both Azerbaijan and the EU. And Russia did not see the beginning of the actual realization of the Southern Gas Corridor EU through TANAP and TAP. Both projects could cost $ 10 billion to Gazprom And according to estimates the minimum cost of the "South Stream" (Black Sea area and part of Europe) - 15.5 billion euros (about 20 billion dollars). According to independent experts, taking into account the cost of construction of the connecting pipe between the Yamal and the Black Sea coast of Russia estimates the total cost closer to 50 billion euros. Will I lose in such financial conditions of European partners desire to "Gazprom" to fund the project of the Kremlin? The failure of the Nabucco West plans to adjust a number of European countries to diversify gas supplies to reduce dependence on Russia. The Visegrad countries have additional arguments in favor of the consolidation, the foundation of which is the project of gas corridor North-South.